Ministerio de Cultura denunció a los miembros de Greenpeace que invadieron las líneas de Nasca. 19:00 | Lima, May. 19. Greenpeace activist Wolfgang Sadik, who seriously damaged Nazca Lines in 2014, has been given a three year and four month suspended prison sentence during a hearing in Peru's southern Ica region. As is known, Sadik and other activists laid down a banner that read "Time for Change! 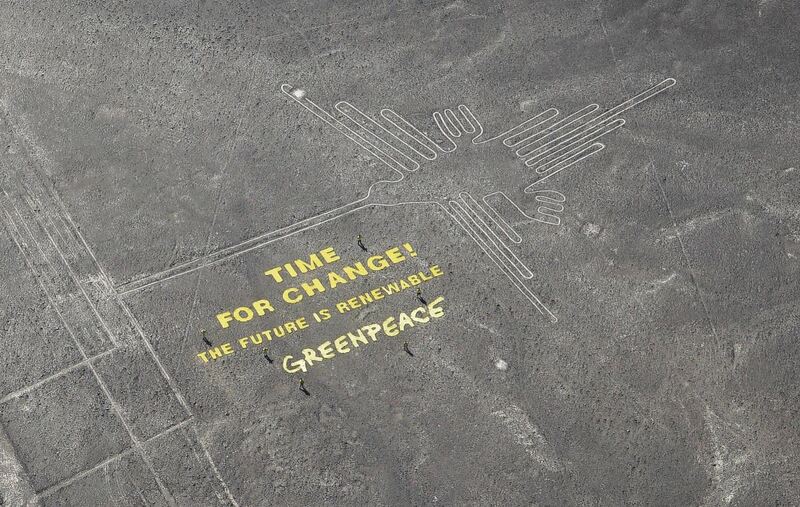 The future is renewable" next to the Hummingbird geoglyph, causing permanent damage on it. The activist shall meet behavior expectations such as reporting to Court on his activities every six months, and paying compensation of S/650,000 (about US$198,170). Wolfgang Sadik opted for an early termination of the process, accepting his responsibility for the irreparable harm he did to the Andean nation's cultural heritage.